I just finished reading a book last night called “A God of Many Understandings? The Gospel and A Theology of Religions” by Todd L. Miles. I recommend this book to anyone who desires to convert those of other faiths (Muslim, Buddhist, Hindu, Confucian, Mystic, etc.). 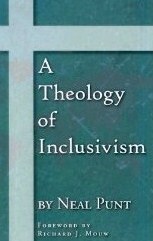 Todd Miles does a wonderful job of refuting the inclusivist position of Arminians such as Clark Pinnock and Amos Yong. Let me just say that, while both inclusivists are Arminian, I disagree with their theology. F. Leroy Forlines is an example of an Arminian exclusivist, one who firmly believes that Christ is the only way (and name) for salvation. I firmly believe that those of us who are conservative, evangelical Arminians should support guys such as Leroy Forlines and staunchly oppose the inclusivist theology of religions as advocated by Clark Pinnock and Amos Yong. I finished Miles’s book and sat down to start reading Neal Punt’s “A Theology of Inclusivism.” I actually wanted to read it sooner, but other magnificent research reading got in the way (thanks so much, Dr. Ken Keathley--- smile!). “But, strange as it may seem, none of these Spirit-directed activities are a prescription or prerequisite for our union with Christ, not even faith” (“A Theology of Inclusivism.” Allendale: Northland Books, 2008, page 54). According to Punt, faith is not a “prerequisite,” or pre-requirement, for salvation. Faith has been labeled as a “prerequisite” (from the statement above) and a “condition” for salvation. Punt states that faith is not a requirement to be met before salvation, so he clearly espouses the Calvinist notion of regeneration (that is, that regeneration comes before faith). God first regenerates, and then the person excercises faith, which, for Punt, is a “fruit not a condition” (see pg. 49). And why is it that faith cannot come before regeneration? “Any requirement or condition for salvation would be incompatible with the undeniable fact that by Adam’s transgression, he and his descendants became ‘dead’ in sin, not merely weak or sick (Eph. 2:1)” (55). So there can be no conditions for salvation, not even faith. Punt has confirmed this so far. “It appears that if nothing else, faith is one prerequisite, condition, or requirement for salvation” (56). But his statement made on page 56 contradicts what he wrote on pages 49, 54, 55, etc. On the surface, to say “faith is not a condition for salvation” (54) and then turn around and say “faith is a condition for salvation” is to make contradictory or opposing statements. To say the latter statement signals to Punt’s readers that he has negated the former statement. Great article. I too strongly reject the inclusive doctrines that some Arminians want to hold to. Oddly Neal Punt is a Calvinist if I'm correct. Thankfully Arminians AND Calvinists can work together to proclaim that Jesus is the only way to God and that we are saved only in Him and faith in Him. John Piper, for example, has written a solid book refuting the inclusive teachings entitled Jesus: The Way to God. We must together with others who hold to the inerrancy and infallibility of the Scriptures to refute error. Thanks for commenting. I agree wholeheartedly with your response. While Calvinists and Arminians disagree on certain theological convictions, we do believe that Christ is the only name given among men whereby we must be saved (Acts 4:12). You should stick around the site in the coming days...I'm planning to do an entire Theology of Religions Series. This is the work I'm reading and researching in my independent research class this semester with Dr. Ken Keathley. By God's grace, I will also be privy to a "Soteriology and World Religions" Doctoral Seminar this coming June 2011. Just think: I get to study more theology right after I graduate!!! While I would love to start a theology of religions series now, I must continue to tread through Neal Punt's work. Pray for me, though, as I juggle a full-time semester and blog ministry. I will pray for you indeed. Our Father knows your needs (Matthew 6:8). BTW, what book are you using for your independent research class? I also did an independent research study while in college. I did mine on the doctrine of sanctification in church history. I am reading 10 books for Dr. Keathley, somewhere in the ballpark of 3000 pages. Three-thousand!!! (6) "Four Views on Salvation in a Pluralistic World", by Dennis Ockholm (editor). Contributors to this work are John Hick (Pluralism), Clark Pinnock (inclusivism), Alister MacGrath, and Geivett/Phillips (Exclusivists). (9) "Faith Comes by Hearing: A Response to Inclusivism" by Robert Peterson and Christopher Morgan, eds. (10) "Is Jesus the Only Savior?" by Ronald Nash. In addition to this, I also have a research paper due at the end of the semester, not to mention a PhD seminar in Soteriology and World Religions this summer 2011 with Dr. Keathley. I will have some blogwork to post on the above reading when the time comes. Maybe this summer, perhaps? more likely this summer...but possibly earlier. It just depends on whether or not I can finish the reading in time. Pray for me. The research is good, but I have to tackle it along with the other classes. Btw, Roy, you should be jealous of me studying while you drive a truck (lol). Just kidding. What you are doing is honorable, too. Taking care of a family is a huge responsibility, one that I am certainly not ready to handle. So I applaud you for handling a family. What I'm doing is nothing short of "easy stuff" (lol). Your support always means so much. I constantly thank God for your blogging presence in my life and your constant encouragement.